Over 300 members of IAM District 751 attended a Member Solidarity Conference last weekend in Seattle. District leadership puts on the conference to educate members on the power they have when standing together in unity. View photos from the Solidarity Conference on the IAM Facebook page. 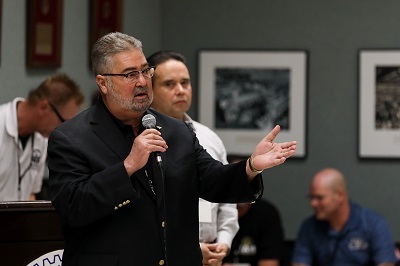 International President Bob Martinez and Western Territory General Vice President Gary Allen were on hand to address the conference and answer questions from attendees. 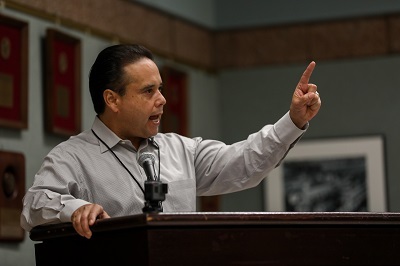 Martinez again praised District 751 leadership and members for their role in enshrining the Membership Bill of Rights in the IAM Constitution at the 2016 Grand Lodge Convention. He also thanked them for their solidarity with newly-organized IAM members at Boeing South Carolina. “Boeing may think they can keep IAM representation from South Carolina workers, but let me promise you something right here and now, they will never, ever succeed,” said Martinez. Attendees saw multiple presentations from various district staff covering various topics including organizing, Understanding Your Rights, Challenging Pay Disparity, The Power of Solidarity, the Membership Bill of Rights, Educational Benefits, Safety on the Job and the IAM Free College Benefit. The post IP Martinez, GVP Allen Fire Up Membership at District 751 Solidarity Conference appeared first on IAMAW.